better than lovely happy mail?! It is pure coincidence that it all matches so nicely! 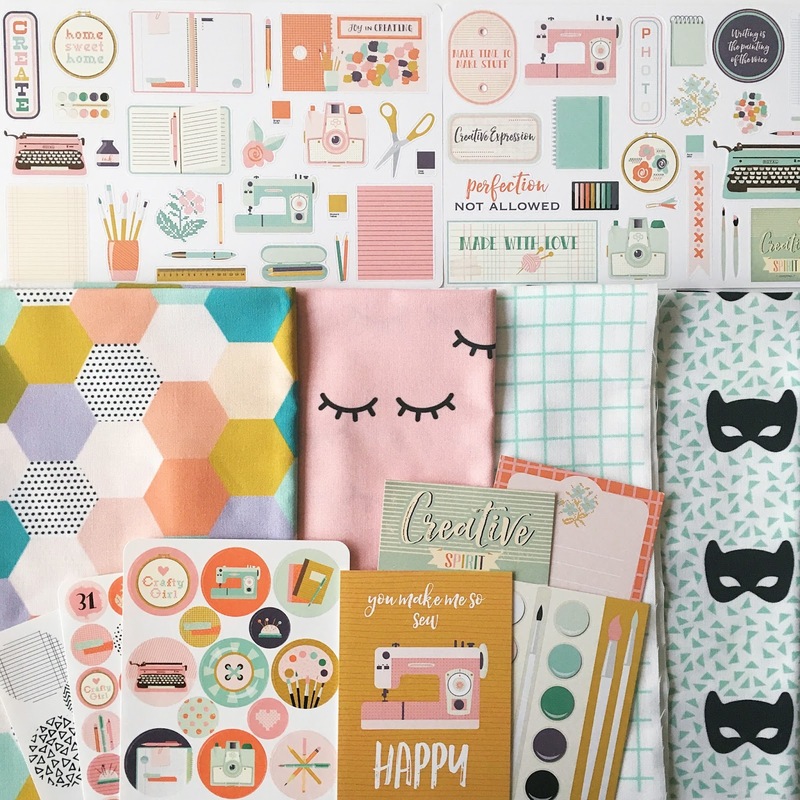 The die cuts, stickers and journal cards that you see top and bottom are all part of a gorgeous kit from The Reset Girl. Her latest kit is 'Crafted', I bought the Essentials Kit and there's also a Deluxe Kit available. I plan on making some cute planner dividers and decorating everything! The fabrics in the centre are all from Spoonflower printed on Kona cotton - they had a special offer of 2 for 1 on FQs. If you don't already know Spoonflower now also ship from Berlin, so the postage costs are really cheap for those of us in the UK and Europe. Just make sure you check the box to chose to have it shipped from Berlin! It did take about a month to arrive, which is slow but I love having different fabrics and supporting the designers. left to right: Hexagon/spring/small by ivieclothco; Sleepy Eyes, Blush Background by kimsa; Square Grid - Mint by kimsa and Black white and mint mask by pencilmein. I've always meant to ask if you were Fred Astaire incognito :) love that quote . Curiosity has Gotten the best of me reference the blushfabric w/ the eye lashes and the cat masks too . that looks like a lovely cheery stash of goodies! Love the sleeping eyes print!